One of the readers of the blog asked me this question: Early military watches did not have the date, how do they tell the date? Well that question was an interesting question and set my mind thinking. How did they tell the date? Well, I did not have the answer, so the next best thing is to ask. So I did and the best solution was to post the question on the popular military watch forum. I got some pretty interesting answers. 1. The wristwatch is used to coordinate short duration activities, those of a day or two, so no need for date. 2. 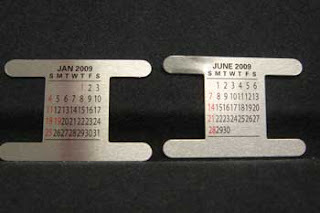 Having a little light gauge metal (usually aluminum) calendar pages on his watch band, which attached via little tabs wrapped around the band. 3. If the men in the field couldn't tell the day or date they wouldn't know how long they had been out there so it was easier to keep their morale up, hence no need for date function. 4. There are other things to worry about. I have to say that the answers above are interesting but not conclusive. All in all, I too prefer watches without date. Why? I like the dial to be clean and simple. Maybe the answer could be as simple as that.